Chinese soprano Ying Huang has generated an extraordinary level of critical acclaim and popular excitement in a career that has already spanned many arenas, including opera and concert stages, television, recordings and motion pictures. She made a sensational debut as Cio-Cio San in Francois Mitterand’s acclaimed feature film Madama Butterfly, and has gone on to a career of concerts, recitals and operatic engagements that has embraced a worldwide audience. Ms. Huang is consistently sought after on stages throughout the world for her portrayals of Mozart soprano roles. Her performances as Zerlina in Don Giovanni, Susanna in Le nozze di Figaro, Despina in Così fan tutte and Pamina in Die Zauberflöte have been seen in opera houses ranging from the New York City Opera and Santa Fe Opera to opera companies in Asia, Europe and Latin America. Ying Huang is also an active concert soloist with leading orchestras including the Chicago Symphony, Boston Symphony Orchestra, and New World Symphony. The 2006-2007 season marks her Metropolitan Opera debut in the role of Pamina in the new English language version of The Magic Flute. She will star in the Metropolitan Opera’s first simulcast into movie theaters throughout the world. 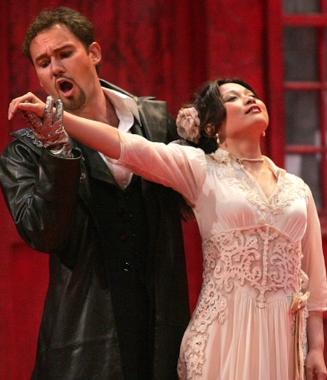 Ms. Huang has sung this role with the Opera Theatre of St. Louis, Opera Colorado, and Amsterdam Baroque Orchestra. She recently debuted at the Santa Fe Opera as Zerlina in Don Giovanni, and Puerto Rico’s Teatro de la Opera as Susanna in a televised production of Le nozze di Figaro. Other engagements this season include the world premiere of Poet Li Bai with Central City Opera, the soprano soloist in Bach’s Wedding Cantata with the Seattle Symphony and Carmina Burana with the Pacific Symphony. One of Ms. Huang’s most notable achievements is her creation of the role of Du Liniang in Tan Dun’s Peony Pavilion. The world premiere production, by renowned director Peter Sellars, opened at the Vienna Festival and went on to London, Paris and California. Other roles have ranged from Gilda in Rigoletto with Michigan Opera Theater to Sophie in Der Rosenkavalier with Danish National Opera. 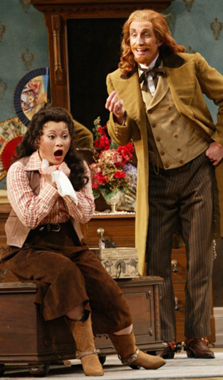 Ms. Huang made her operatic debut as Nannetta in a new production of Verdi’s Falstaff at Cologne Opera. Soon afterwards, she debuted with L’Opéra de Nice as Serpetta in La finta giardiniera, and with Michigan Opera Theatre as Sophie in Werther opposite Andrea Bocelli and Denyce Graves. She returned to Detroit as Despina in Così fan tutte and as Norina in Don Pasquale, a role that she later sang at Arizona Opera. In the concert hall, Ms. Huang has a distinguished career as an interpreter of the Mahler repertoire. Her many appearances include Mahler’s Second Symphony with the Houston Symphony under Christoph Eschenbach; the Fourth Symphony with the Detroit Symphony under Neeme Järvi, and with the New World Symphony and Michael Tilson Thomas; and the Eighth Symphony with the Chicago Symphony, again under Maestro Eschenbach. She has had a close relationship with the Cologne Philharmonic and James Conlon, performing Poulenc’s “Stabat Mater”, Mozart’s “Exsultate, jubilate”, Debussy’s “La Damoiselle Élue”, and concerts of Mozart and Rossini. Other engagements have included Carmina burana with the San Francisco and Houston Symphonies; Mozart’s Coronation Mass with the Mostly Mozart Festival in New York and Tokyo; Handel’s Messiah with the Seattle Symphony; and Bachianas Brasilieras with the Houston Symphony and with cellists of the Berlin Philharmonic. She has made many special appearances, including a concert in Athens to commence festivities for the Olympics, a gala concert with Andrea Bocelli for the 2010 Shanghai Expo, and “Christmas in Vienna,” a television special with Placido Domingo. She was recently featured as soprano soloist in The Lord of the Rings: Six Movements for Orchestra and Chorus with the Montreal Symphony under Oscar-winning composer Howard Shore. Ms. Huang maintains an active career in Asia, singing many solo and orchestral performances throughout China, Singapore, Taiwan and Korea. Most recently, she toured with the Guangzhou Symphony Orchestra in Chen Qigang’s Iris devoilee, and was a soloist with the Shanghai Quartet. 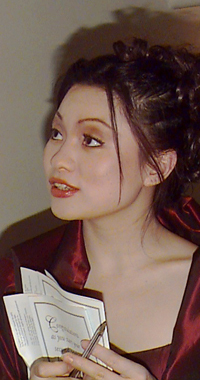 Madama Butterfly, in addition to her first solo disc, Operatic Arias with James Conlon and the London Symphony Orchestra, and Bitter Love, a collection of songs composed and conducted by Tan Dun. Her most recent Sony release is Richard Danielpour’s Sonnets to Orpheus and Roger Waters’ Ça Ira on CD and DVD with Bryn Terfel and Paul Groves. She can also be heard as Silvia in Haydn’s L’isola disabitata on the Arabesque label and on Operatica: Shine on the E-Magine label. A graduate from the Shanghai Conservatory of Music, she first came to the attention of the West when she captured second prize at the 19th Concours International de Chant de Paris. In her native China, she is a special guest soloist at the Shanghai Opera House and is widely considered one of China’s pre-eminent cultural ambassadors and singers.